Three years ago, I attended a conference hosted by the Livable Communities Coalition, then still a part of the Atlanta Regional Commission. It was a day long affair of presentations and discussions, with one led by famous author and city planner Jeff Speck. My favorite part of the event came towards the end of the day, when the audience was split into groups and given large maps of various MARTA stations with instructions to design walkable, dense, transit-oriented developments. My group was given a map of the King Memorial MARTA station, between The Old Fourth Ward and Sweet Auburn, and the adjacent parking lot. We sketched up a detailed development that honored the historical surroundings while making a modern and appealing addition to the community. My favorite element of the design was a pedestrian sky bridge connecting the development to the MARTA station over the CSX lines, rendering amazing views of the city skyline in my imagination. Now, plans are underway to develop just such a project as part of MARTA’s Five Year Transit Oriented Development Strategic Plan (though I doubt it will include a sky bridge). A rendering of the proposed development. Via ATL Urbanist. Long before MARTA had any plans for the station, or before there were even any plans for MARTA for that matter, Sweet Auburn and The Old Fourth Ward were some of the City’s finest communities. Sweet Auburn was once home to the most prosperous African American business community in the nation, but the neighborhood was hard hit after the construction of the I-85/I-75 Connector in the 1950’s and 60’s. Over the next 50 years, it went from African American business community and Civil Rights hotspot to blighted neighborhood, and only within the past decade became the haven for hipsterdom it’s infamous for today. With the advent of the Atlanta BeltLine and resurgence of in-town residents, however, both neighborhoods have become increasingly popular as residential spots, too. As the neighborhoods have grown in popularity, many long-time residents have wondered and worried about how they will change. 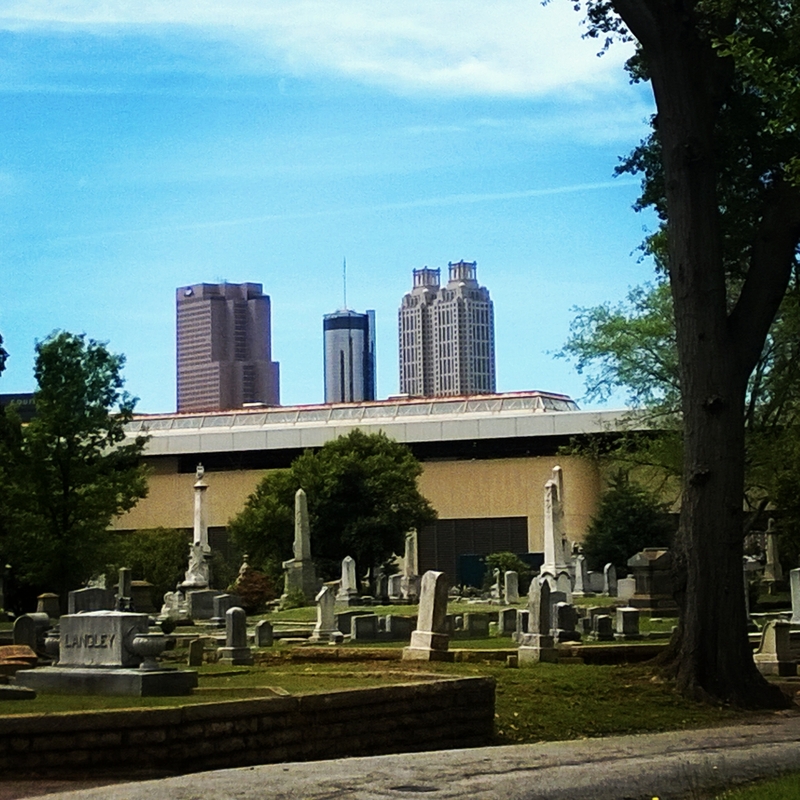 Oakland Cemetery, King Memorial MARTA Station, and Downtown in the distance. Meanwhile, MARTA began exploring the possibility of leasing land presently used for parking at ten of its stations as part of this Five Year TOD Plan, including King Memorial Station. 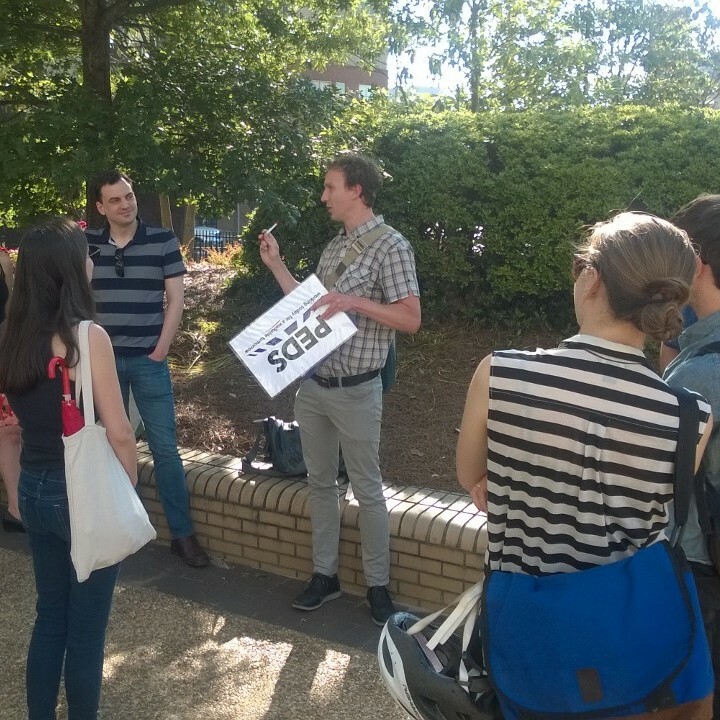 Last week, I attended another one of PEDS’ walks and had the opportunity to learn more about the plans for King Memorial straight from Amanda Rhein, MARTA’s Senior Director for Transit Oriented Development. By the time I arrived at King Memorial Station, PEDS’ Ian Sansom had already assembled the small crowd and initiated the introductions. 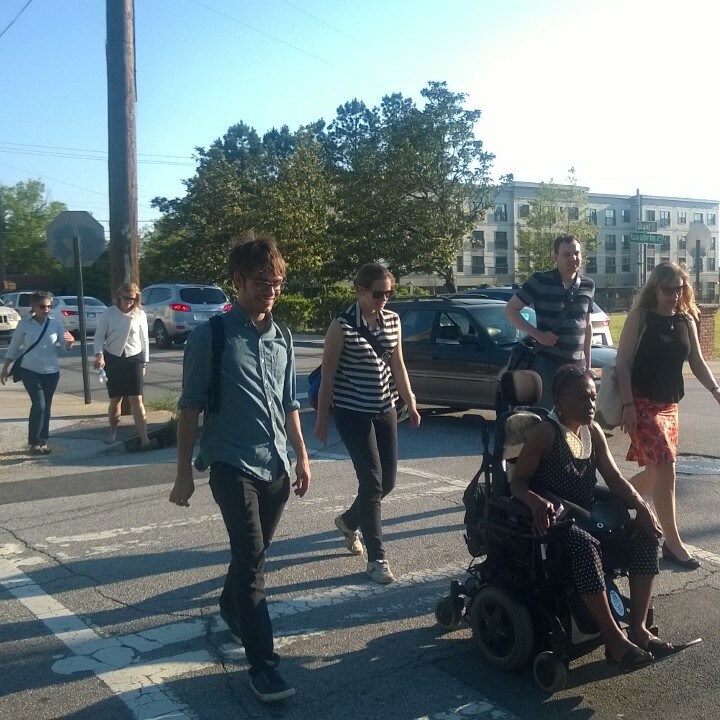 After her own short introduction, Rhein jumped right into what we could expect for the MARTA Station’s curb appeal, from adding street trees and furniture, to improving sidewalk and station handicapped accessibility, even opening up the possibility for making Decatur Street a complete street. Rhein also announced that MARTA would even be remedying community concerns about the Grant Street bridge, repairing the leaking pipes and replacing the burnt-out light bulbs that have long maligned the bridge. This drew praise from the small group–these fixes have been wanted for so long and it’s great to finally see them being addressed. At the other end of the tunnel on the left is the parking lot in question. A Grady shuttle pulls through the gate as we look on, shuttling hospital employees to their shifts. This 4.4 acre lot, mostly empty by the time our walk reaches it, is where over 350 residential units and upwards of 10,000 square feet of retail space will be in the near future. It is directly adjacent to Oakland Cemetery, adding to the allure of the area, but Rhein is exploring possibilities for incorporating the Cemetery’s parking in a future addition to the TOD plan. An area perspective of the proposed development. Via ATL Urbanist. When some in the crowd probe her for more precise numbers on parking, she hesitates for a moment. With a hint of regret, Rhein tells the group that the development will most likely still follow the multi-use development standard parking ratio of one spot per occupant of the development, most likely with more to accommodate visitors to the shops and businesses in the development. The group walking back towards King Memorial Station. Amanda Rhein and PEDS President and CEO Sally Flocks bring up the rear. 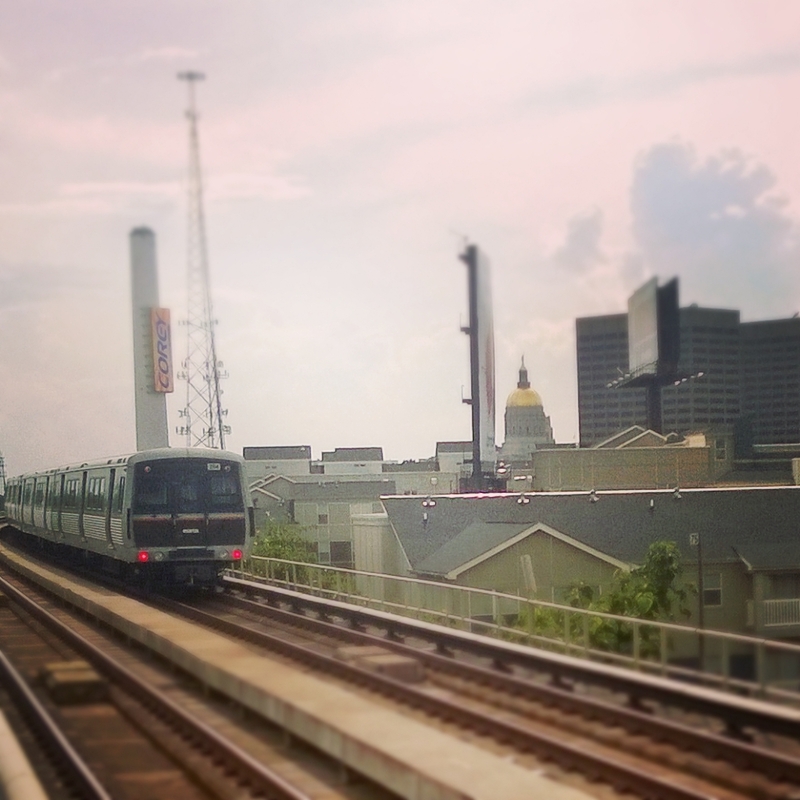 A MARTA train pulls out of the King Memorial Station, heading West towards Georgia’s golden dome. Givens, per usual, is right; if the aim of this and MARTA’s other developments is to increase dense urban development while simultaneously reducing traffic and increasing transit ridership, not to mention making MARTA cool, transit can’t just be the top priority, parking must not be. These developments are in any case an improvement, but they should be more than that: they should be an ambitious and bold statement that living without a car in Atlanta is not just feasible, but better than the alternative.